I am interested in flying wings and a couple of weeks ago I started researching them. I found mh-aerotools.de website and think it's a great source. The website stated that flying wings need twist to stabilize, but I don't know how to do this or even is it required at all. Is a twist needed and if so how do I to calculate it? Note: I chose airfoil EH 1.0-9.0 for this purpose. Twist is closely coupled to the wing's sweep angle, airfoil camber, taper ratio and the desired level of static longitudinal stability. Other factors are the desired spanwise lift distribution and maneuverability. There is no simple, general formula: In the end twist, or, more precisely, local reflex camber, is the consequence of your selection of the parameters mentioned above. Static longitudinal stability means that the aircraft will return to the trimmed angle of attack after a disturbance. This is made possible by producing proportionally more lift in the forward part of the wing than in the rear part. Reflex airfoils do it all by themselves and unswept flying wings do not need washout, but a proper reflex airfoil. The Horten flying wings had highly tapered wings and used a bell-shaped lift distribution over span which produced a small downforce at the tips. This helped a lot to reduce adverse yaw and allowed them to do away with a vertical tail. Also this made stall chararcteristics benign. This lift distribution was reached by extensive washout (as much as 8°). If you add stability by computer control, washout will not be needed and you can use an elliptical planform for best performance. This will, however, have unfavorable stall characteristics and needs wing fences when the wing is swept. Moderate sweep adds stability and damping, but above a critical combination of aspect ratio and sweep angle it is hard to achieve satisfactory stall characteristics. 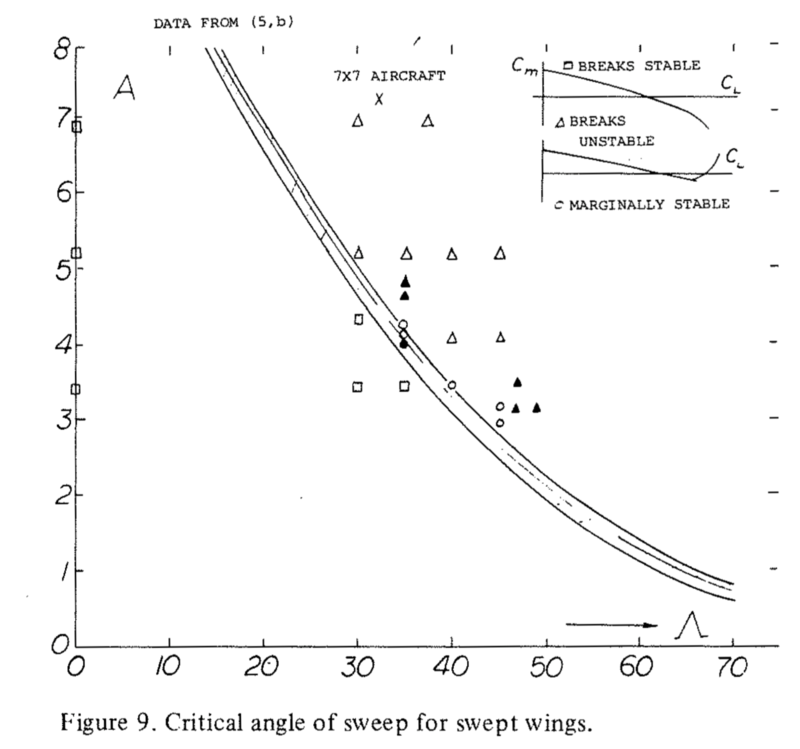 Critical angle of sweep for swept wings, from Chapter 16 of S. Hoerner's Fluid Dynamic Lift. Too much aspect ratio and sweep will result in a strong pitch-up when the wing stalls. Note that now the planform is tightly coupled to the static margin and, consequently, to the location of the center of gravity (cg). Flying with a more forward location of cg than ideal means more negative elevon deflection angles and lower local lift at the tips than ideal, and vice versa. 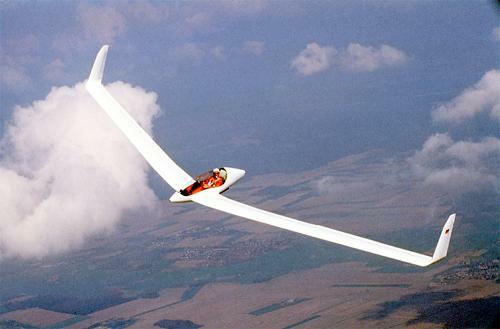 The SB-13 flying wing glider uses this technique and has a taper ratio (ratio of tip to root chord) of 0.8. It uses two elevons over the outer 50% of span, the inner of which travels 1/3 of the trim deflection of the outer elevon. Twist is zero for the inner half of the wing, changes from 0° to -1.5° over the 0.15 m section where the root airfoil (HQ 34 N) changes over to the tip airfoil (HQ 36 K) to adjust for their difference in zero-lift angle and increases again linearly towards the tip to +0.5° (I hope I got that detail right, typing all this from memory). The negative washout was chosen to allow the elevons to have 4° twist themselves, so in sum (fixed wing and elevons) the wing has increasing twist towards the tips. In flight, the elevons will always have a slightly negative deflection, so the effective washout is even stronger. Not necessarily. An unswept flying wing does not benefit much from twist. It will only help to add some stall margin at the tips. A positively swept flying wing can also get away without twist if the airfoil is changed over span from positive camber at the root to negative camber at the tip. If the same airfoil is used over the whole span, twist/reflex camber is necessary and cannot be avoided as soon as the cg is ahead of the neutral point: It will result from trimming the wing for the desired angle of attack. How do I to calculate it? Select your desired static margin. Select your desired lift distribution over span. An elliptic distribution will result in the lowest induced drag, and a bell-shaped distribution will give better maneuverability. Select the planform that results in the desired lift distribution when trim changes over speed are considered. Use several elevons over span to be able to adjust the local incidence independently. Twist is then a necessary consequence of trimming the aircraft. The wing twist (washout for swept back wings) helps in speed and stall stability. Consider a normal aircraft- i.e. the ones that have a tail (horizontal stabilizer)- in this case, the wing produces an upward force, while the tail produces a downward force. Here, as the nose goes down, the speed increases, and the lift produced by the main wing means that the nose pitches up again. The opposite happens when it the nose goes up- the speed drops and as the airspeed decreases, the nose drops (as lift is now lesser). As the wing is at a higher incidence compared to the tail, it stalls first, and the stabilizer (which is still producing lift) pitches the nose down, bringing it out of the stall. As there is no horizontal stabilizer in case of tailless aircraft, these effects have to be built in into the wing itself. One way to do so is to have a washout- having a swept wing with the outboard area at an incidence lesser than the inboard (root) section. In this case, as the speed increases, the front portion of the wing (near the root in swept wing) produces more lift as the speed increases, pitching up the nose. The opposite happens as the speed decreases- the nose pitches down as the lift is decreases with airspeed loss. As the aircraft approaches stall, the inboard section (at a higher angle of attack) stalls first, while the outboard section, which is at the rear (due to the wing sweep) causes the nose to pitch down, causing the aircraft to come out of stall. The added advantage is that the control surfaces are still functional. The same effect can be obtained by using a reflex airfoil and an unswept wing, with the reflexed portion acting as the tail. There is not any need to use twist in a flying wing aircraft IF the chosen profile is already reflexed. The use of twist will generate a very reduced optimal speed envelope and it will create as well a repetitive longitudinal phugoid motion (typically lasting at intervals of 7 seconds, in full size craft), similar to porpoising in watercraft. A good reflexed profile or a pertinent series of profiles progressively changing form root to tip will perform better. The basic idea is to have a profile/s in which the position of the Cm will not be excessively altered with changes of AoI (or AoA when in flight). Not the answer you're looking for? 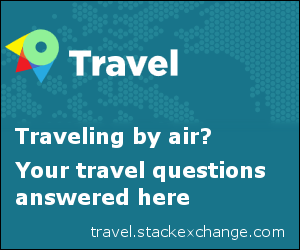 Browse other questions tagged aircraft-design aerodynamics wing or ask your own question. What is the need for twist along a wing? Is there a software to calculate parameters from certain inputs on a flying wing? How does washout affect the wing incidence required?